The reliability of acetabular morphology has not been validated with comprehensive inter- and intraobserver agreements involving several contemporary measurements among a group of hip surgeons. In addition, with the proliferation of measures aimed at evaluating acetabular morphology, there may be redundancy among these measures. Therefore, this study had 2 objectives: (1) to determine the intra- and interrater reliability of contemporary measures of acetabular morphology among a group of hip surgeons and (2) to determine the correlations between measures of acetabular morphology. This study received institutional review board approval. The authors randomly selected well-positioned standing AP pelvic radiographs from 40 patients who underwent a PAO for acetabular dysplasia between January 2014 and December 2016 at their institution. Among each of these 40 patients, 1 hip, which could be either the treated hip or the contralateral hip, was selected at random for evaluation. The mean age of the patients was 25.8 years (range, 12.4–44.0 years), and there were 3 males and 38 females. Laterality of the images evaluated included 19 right hips and 21 left hips. With the random selection of laterality, 24 of the 40 hips had undergone PAO. Thirty-seven patients had undergone standard PAO for symptomatic dysplasia, 2 patients had undergone anteverting PAO for symptomatic retroversion, and 1 patient had undergone reverse PAO for global overcoverage. Eighteen patients had undergone bilateral PAO for symptomatic hip disease. Lateral center-edge angle. A best-fit circle was placed over the femoral head to mark the center. The lateral-most sclerotic portion of the weight-bearing dome was marked. The angle between the center of the femoral head (point C) to the vertical longitudinal axis and the lateral edge of the sourcil (point A) was recorded (A). Medial center-edge angle. A best-fit circle was done over the femoral head to mark the center. The medial-most sclerotic portion of the weight-bearing dome was marked (point B). The angle between the center of the femoral head to the vertical longitudinal axis and the medial edge of the sourcil was recorded (B). Acetabular arc. A best-fit circle was done over the femoral head to mark the center. The angle between the center of the femoral head and the medial and lateral edges of the acetabular sourcil was recorded (C). Extrusion index. A vertical line was drawn at the lateral edge of the sourcil (point A). Two other vertical lines were drawn at both the most medial and the most lateral aspects of the femoral head. The ratio of the uncovered femoral head (distance e) over the total diameter of the femoral head (distance d) was recorded. Acetabular index. A horizontal line connecting the medial portions of the sourcil of both hips was drawn first. A second line through the most medial portion of the sclerotic zone (point D) and the lateral edge of the sourcil (point A) was then drawn. The angle formed by these 2 lines was measured (A). Sharp's angle. A horizontal line connecting the caudal tips of bilateral teardrops was drawn. A second line connecting the lateral sourcil (point A) and the caudal tip of the teardrop (point E) was drawn. The angle formed by these 2 lines at the teardrop was measured (B). Posterior wall sign. A best-fit circle was drawn over the femoral head. The center of the femoral head was marked (point C). A positive result was a posterior acetabular rim medial to the center of the femoral head. A negative result had the acetabular rim lateral to the center of the femoral head (A). Crossover sign. The anterior and posterior walls of the acetabulum were drawn on the pelvic anteroposterior radiograph. A positive result was noted if the wall crossed below the lateral edge of the weight-bearing sourcil (B). Acetabular wall index. A best-fit sphere was drawn over the femoral head. The radius of the circle was determined. A line was drawn from the medial edge of the circle to the anterior (AW) (C) and posterior (PW) (D) wall and measured along the femoral neck axis. The anterior acetabular wall index and the posterior acetabular wall index were calculated as the measured distance over the radius, respectively. Femoro-epiphyseal acetabular roof index. The central third of the physeal scar (typically a straight line) was identified, and its most medial and lateral points were marked and connected. The angle was completed by using the most medial (point D) and lateral (point A) points of the sclerotic weight-bearing sourcil. A positive femoro-epiphyseal acetabular roof index was a laterally directed angle, with the apex pointing medially. A negative femoro-epiphyseal acetabular roof index was a medially directed angle, with the apex formed pointing laterally (A). Delta angle. A best-fit circle was drawn over the femoral head. The delta angle was created by 2 lines formed between the medial edge of the weight-bearing sourcil (point D) and the superior edge of the fovea capitis (point F) connecting in the center of the femoral head (point C) (B). Each surgeon performed the radiographic measurements independently and was blinded to the other participants' results. With a 4-week interval and a blind and independent approach, the 3 surgeons performed a second reading. The sequence of the images was randomized and the labeling was changed in between the 2 sessions. To simulate the usual clinical practice, the authors used the regular medical imaging system from the institutional picture archiving and communication system (Synapse 4.4; Fujifilm Medical System, Stamford, Connecticut) for radiographic measurements. The surgeons were not permitted to change the image zoom, but they were allowed to adjust the contrast to identify the appropriate reference points. Descriptive statistics were used to summarize the radiographic parameters among all of the patients included in the sample. Linear mixed models were used to estimate the variance of components used in the calculation of intraclass correlation coefficients (ICCs). Inter- and intrarater reliability values as well as the standard error of measurement were estimated for all continuous radiographic measures. The kappa statistic was used to estimate inter- and intrarater agreement for all binary radiographic measures. Bootstrapping was used to estimate nonparametric 95% confidence intervals (CIs) for all inter- and intrarater reliability values. Among the continuous variables, measurements were averaged across raters and trials. Pearson correlation coefficients were calculated for all possible pairs of the averaged radiographic measures. All statistical analyses were performed with SAS version 9.4 software (SAS Institute Inc, Cary, North Carolina). The agreement between different surgeons (interrater reliability) was lower than that between individual surgeons (intrarater reliability). Regarding intrarater agreement among the continuous variable measures, the authors observed high ICCs for all measurements. The LCEA and the acetabular index were the most reliable measurements among individual surgeons, having the highest intrarater agreement. 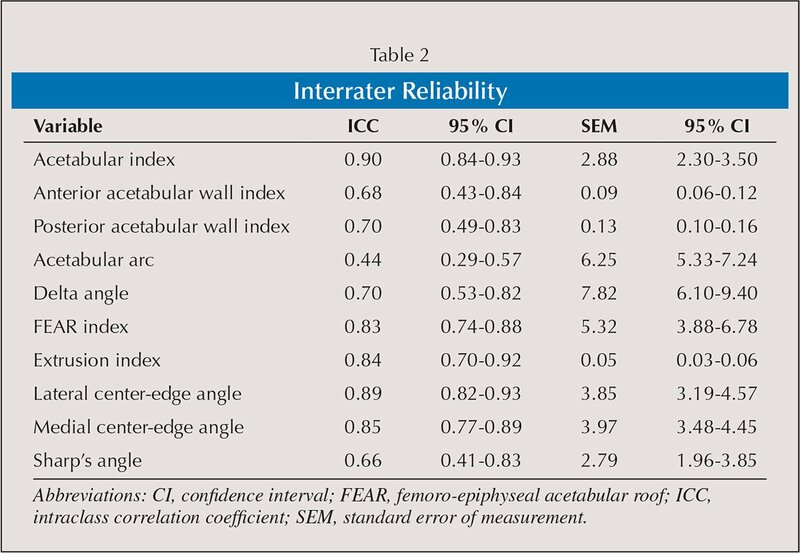 Reliability, from most to least reliable, followed the order of LCEA, acetabular index, MCEA, FEAR index, extrusion index, acetabular arc, delta angle, anterior wall index, posterior wall index, and Sharp's angle (Table 1, Figure 6A). The binary measures evaluated included the posterior wall sign and the crossover sign. The posterior wall sign had an intrarater agreement of 0.68 (95% CI, 0.49–0.86), and the crossover sign had an intrarater agreement of 0.85 (95% CI, 0.52–0.89). Intrarater (A) and interrater (B) reliabilities of continuous variable measures of acetabular morphology. Abbreviations: AI, acetabular index; AWI, acetabular wall index; Fear, femoro-epiphyseal acetabular roof; LCEA, lateral center-edge angle; MCEA, medial center-edge angle. Regarding interrater agreement among the different surgeons, the acetabular index had the greatest interrater agreement, whereas the acetabular arc angle had the lowest interrater agreement. Reliability, from high to low, followed the order of acetabular index, LCEA, MCEA, extrusion index, FEAR index, delta angle, posterior wall index, anterior wall index, Sharp's angle, and acetabular arc (Table 2, Figure 6B). Interrater agreement was 0.35 (95% CI, 0.11–0.54) for the posterior wall sign and 0.66 (95% CI, 0.43–0.84) for the crossover sign. Bivariate correlation was calculated between all continuous variables of radiographic measurements (Figure 7). High positive correlations were found between acetabular index and extrusion index (P=.93) and MCEA (P=.90). 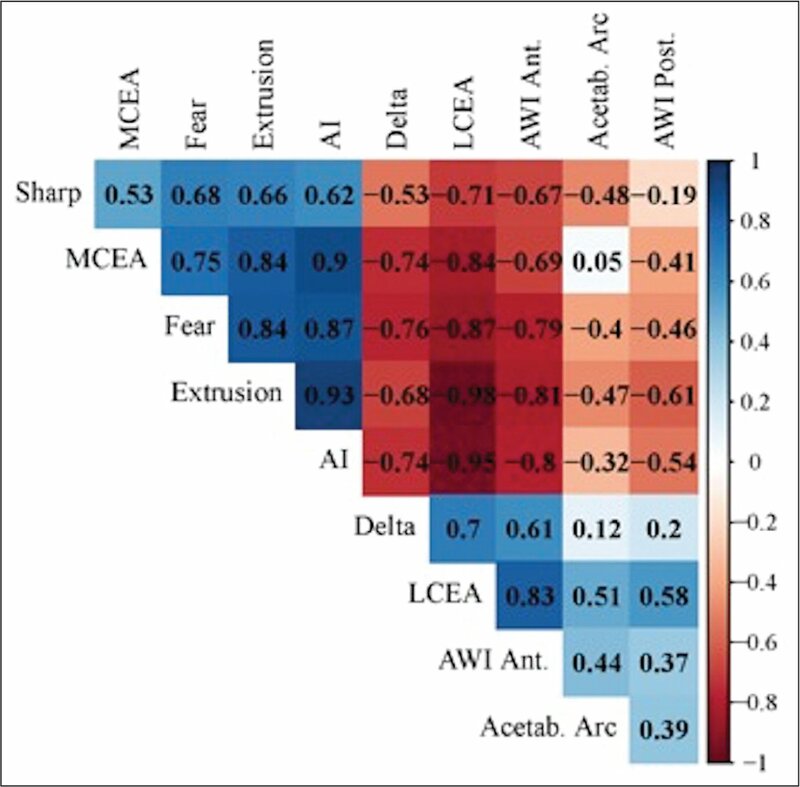 High negative correlations were found between LCEA and extrusion index (P=−.98) and acetabular index and LCEA (P=−.95). The lowest level of correlation was observed between acetabular arc and MCEA (P=.05). Correlation matrix of different measures of acetabular morphology. The key on the right side of the image indicates measures with increasing positive correlation (closer to +1) with a more blue background, those with no correlation with a white background, and those with increasing negative correlation (closer to −1) with a more red background. Abbreviations: AI, acetabular index; Ant, anterior; AWI, acetabular wall index; Fear, femoro-epiphyseal acetabular roof; LCEA, lateral center-edge angle; MCEA, medial center-edge angle; Post, posterior. 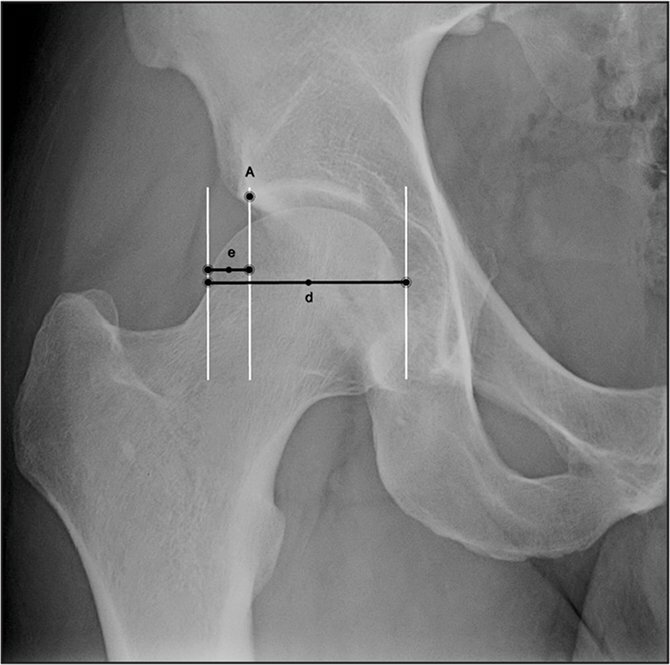 Hip dysplasia and pincer femoroacetabular impingement are common conditions for which primary diagnosis depends on basic radiographic evaluation of acetabular morphology.9,21 Many contemporary measurements have been described in an effort to improve clinical decision-making, surgical indications, and monitoring of patients with these conditions. However, the reliability of many of these measurements has been assessed as part of a secondary analysis of studies with other objectives. This study sought to investigate intra- and interobserver agreements of contemporary parameters for acetabular morphology using a pelvic AP radiograph. In addition, with the proliferation of measurements of acetabular morphology, the authors wanted to determine the correlation between these measurements to determine whether there is redundancy. This study had limitations. Patients were selected from a registry of patients who underwent PAO for symptomatic acetabular deformity. Although the hip evaluated radiographically was selected at random, 18 patients underwent PAO bilaterally. Most of the hips underwent PAO for symptomatic acetabular dysplasia, with only 3 patients having PAO for retroversion or overcoverage. This creates a bias toward these measures being evaluated in dysplasia as opposed to retroversion or overcoverage, which were less prevalent. This may also affect the quantification of ICCs, as limited heterogeneity among the samples can lead to an underestimation of ICCs in this cohort in relation to acetabular version.25 In addition, there was a large preponderance of female patients, given the higher prevalence of acetabular dysplasia in this population. This makes the findings less generalizable to male patients and leads to a less heterogeneous patient population. Most of the measures that the authors investigated had high intrarater reliability. Prior studies have reported different interpretations of ICCs for reliability. A commonly used metric for interpreting ICC is less than 0.5 is poor, between 0.5 and 0.75 is moderate, between 0.75 and 0.90 is good, and greater than 0.90 is excellent.25 If this is applied to the authors' data on intrarater reliability, then all measures had at least moderate reliability, with all but Sharp's angle and the posterior wall sign having good reliability. Comparatively, there was less interrater reliability in this data set, with the posterior wall sign and the acetabular arc showing poor reliability and the anterior acetabular wall index, posterior acetabular wall index, delta angle, and crossover sign all showing moderate reliability. Because 3 surgeons determined all 12 measurements in a single analysis, the authors were also able to compare the reliabilities of these measures to each other. The acetabular index, LCEA, MCEA, extrusion index, and FEAR index were the most reliable measures. All of these measures are designed to evaluate acetabular dysplasia and the resultant instability. 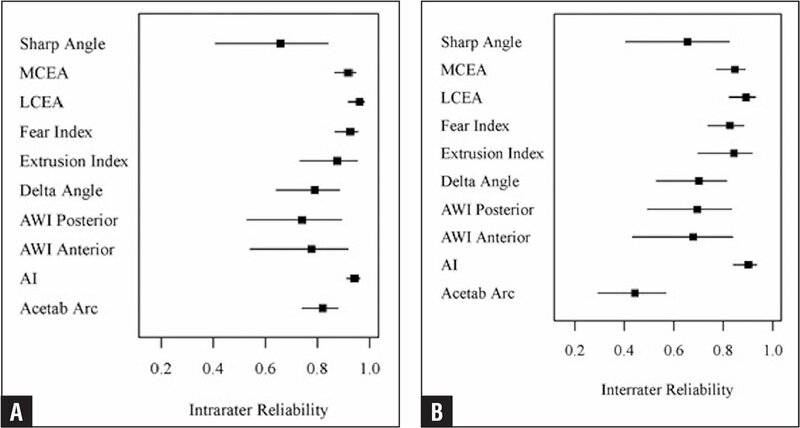 Mast et al14 reported high intrarater reliability, but lower interrater reliability, for acetabular index, LCEA, and extrusion index. 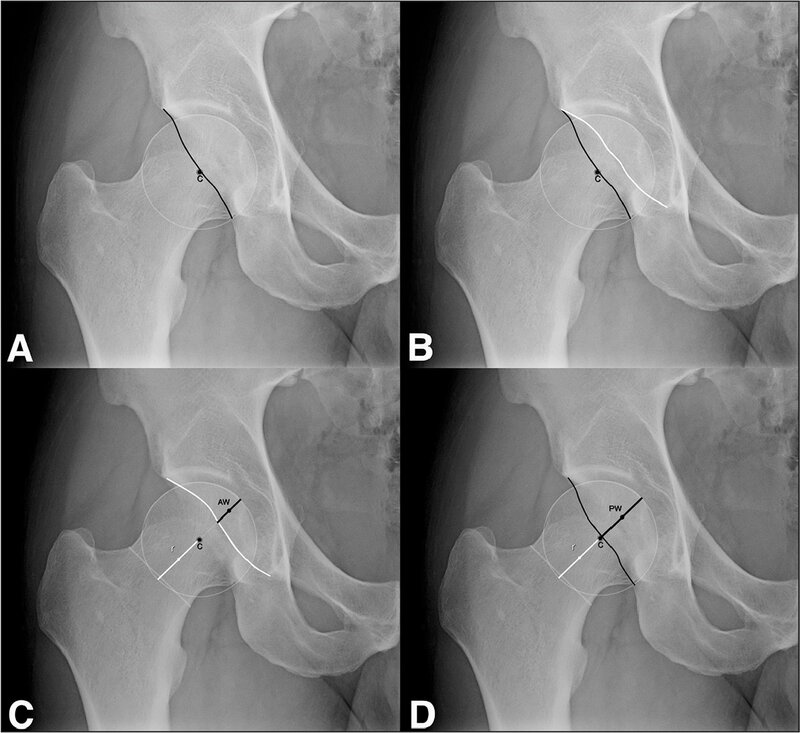 Prior studies reporting lack of interrater reliability may have been the result of the difference in measuring the LCEA at the sourcil edge vs the bone edge.26,27 Other authors have reported similarly good reliability of the acetabular index, LCEA, extrusion index, and FEAR index.11,13,18,28 However, measures of acetabular version—the posterior wall sign, anterior and posterior wall indices, and crossover sign—were less reliable in the current analysis. Nepple et al28 showed a similar relationship of reliability in measures of acetabular dysplasia, but less reliability in measures of acetabular version, on AP radiograph. 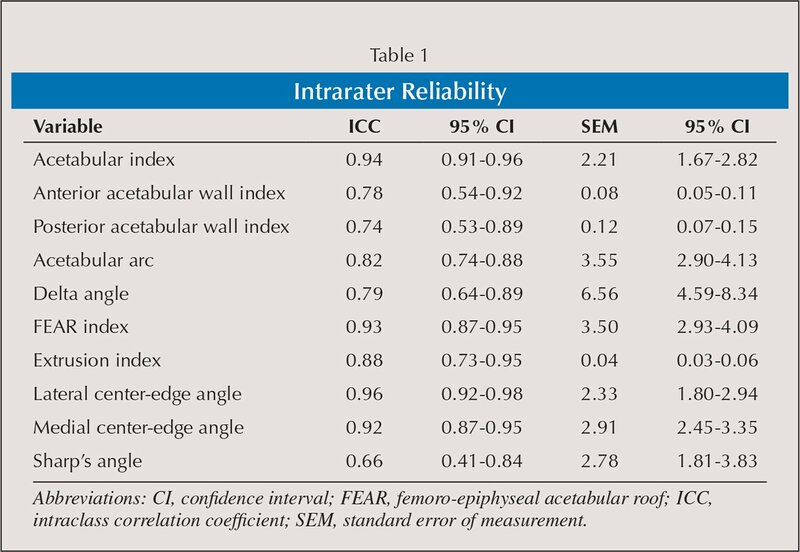 Anderson et al29 found high interrater reliability of anterior wall index and posterior wall index in a large cohort of asymptomatic patients. The discrepancy in results may have been due to the heterogeneity of acetabular version seen in that cohort compared with the current study. Other measures, including the delta angle, Sharp's angle, and acetabular arc, were less reliable between observers. The delta angle was described for use on magnetic resonance imaging; therefore, it may be more difficult to measure on radiographs.19 Sharp's angle, similar to the LCEA, can be measured at the sourcil edge or the bone edge, which may lead to variations among observers.22 For unknown reasons, the acetabular arc was the least reliable measure, despite it functionally being the addition of the LCEA and MCEA measures, which were both reliable in this analysis. Correlations between the measurements in the current study point to some expected patterns. A high correlation between the extrusion index, LCEA, and acetabular index is expected because the uncovering of the femoral head is related to the size and inclination angle of the acetabular weight-bearing sourcil. The current results are also consistent with prior relationships between acetabular version and coverage. Compared with normal or overcovered hips, dysplastic hips are anteverted.20 This is illustrated in the acetabular wall index correlation with LCEA, extrusion index, and acetabular index, classic measures for acetabular dysplasia and instability, suggesting anterior wall deficiency is a radiographic finding consistent with higher degrees of dysplasia. The high level of correlation between measures indicates that the radiographic parameters are not independent measurements. The question arises of whether all of these measurements are measuring the same underlying characteristics of hip dysplasia and thus, although reliable, are redundant. Since Wiberg's15 original investigation in 1939, the AP pelvic radiograph has long been the radiograph of choice for evaluating acetabular morphology and dysplasia. Prior studies have reported good to excellent intra- and interrater reliability of the LCEA, acetabular index, and extrusion index, the classic measures of dysplasia, on AP radiograph.11,13,28 However, new imaging measures continue to be described to aid in the diagnosis and treatment of acetabular dysplasia. The FEAR index is reliable and correlated with imaging evidence of instability in borderline dysplasia.18 The current analysis confirmed the reliability of this measure. However, with the high correlation between all of these measures, only 1 or 2 are likely needed to quantify dysplasia. Studies are needed to determine which of these are the best predictors of functional instability and outcomes of treatment of dysplasia. The authors found less reliability of measures for acetabular version on AP pelvic radiograph. However, one could surmise that acetabular version may be better obtained from 3-dimensional imaging methods because it is reliable between experienced readers when measured on magnetic resonance imaging.30 Among these correlated measures, additional work is needed to identify a set of variables that can be used to reliably diagnose hip dysplasia and predict functional instability and meaningful clinical outcomes. In addition, similar investigations for acetabular overcoverage and retroversion leading to femoroacetabular impingement are needed. This could lead to more efficient use of the AP pelvic radiograph in clinical and research endeavors related to acetabular disease. Commonly used parameters of acetabular anatomy, such as the acetabular index, LCEA, and extrusion index, are reliable radiographic parameters to assess acetabular morphology. However, correlation between measures suggests that they may be redundant in quantifying acetabular morphology. Studies are needed to determine the most important measures to be used in clinical practice. Ganz R, Parvizi J, Beck M, Leunig M, Nötzli H, Siebenrock KA. Femoroacetabular impingement: a cause for osteoarthritis of the hip. Clin Orthop Relat Res. 2003; 417:112–120. Giori NJ, Trousdale RT. Acetabular retroversion is associated with osteoarthritis of the hip. Clin Orthop Relat Res. 2003; 417:263–269. Wiberg G. The anatomy and roentgenographic appearance of a normal hip joint. Acta Chir Scand. 1939; 83(suppl):7–38. Tönnis D. Normal values of the hip joint for the evaluation of X-rays in children and adults. Clin Orthop Relat Res. 1976; 119:39–47. The authors are from the Department of Orthopedic Surgery (ADD, JW, DAM, ENN), Boston Children's Hospital, Boston, Massachusetts; the Department of Surgery–Orthopedics (ADD), UPR Medical Sciences Campus, San Juan, Puerto Rico; the Department of Orthopedic Surgery (CO) and the Musculoskeletal Research Center (PC), Children's Hospital Colorado, Anschutz Medical Campus, Aurora, Colorado; and the Department of Biomechanics (DAM), Medicine and Rehabilitation of the Locomotor System, Ribeirao Preto Medical School, University of Sao Paulo, Ribeirao Preto, Sao Paulo, Brazil. Dr Davila-Parrilla, Dr O'Donnell, Dr Maranho, Mr Carry, and Dr Novais have no relevant financial relationships to disclose. Dr Wylie has received research support from Arthrex. Correspondence should be addressed to: Eduardo N. Novais, MD, Department of Orthopedic Surgery, Boston Children's Hospital, 300 Longwood Ave, Hunnewell 231, Boston, MA 02115 ( Eduardo.Novais@childrens.harvard.edu).